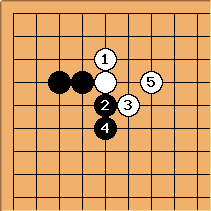 Go Seigen has this to say about : B doesn't want to play a so that W would play at to form the "avalanche shape", so move applies the proverb "opponent's key point is also my key point." 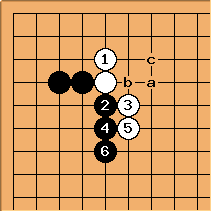 In fact, white will often not play there at all, but play some move on the left side, answered with black a. White may also play sagari instead. However, this is probably only good if white already has some stones along the top side. 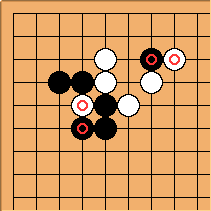 In a game where Kitani played this against Go Seigen, Go had the following to say about this variation: The sequence to here would be certain. Not only would Black have a peep at a (followed by a response at b ) and then an extension to c , and are also unsatisfactory. 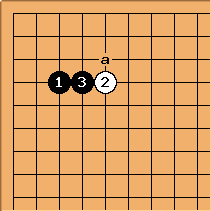 This is a variation I found in the Kogo's Joseki Dictionary. 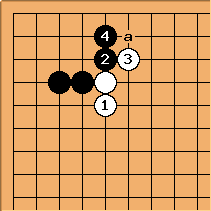 There it is supposed to be joseki. In my opinion white prevent with the black peep at a (diagram above).